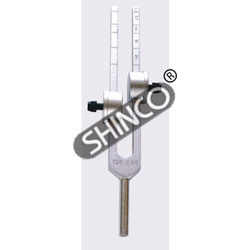 Indian made Tuning Forks are not of very good quality due to some technical reasons. We are supply original Ragg Design, Made in ENGLAND, set of 8, Blued 99.9% accurate. Jullundur (jalandhar) surgicals enterprises offers a broad line of surgical instruments under its brand name je mediguard. jullundur (jalandhar) surgicals enterprises are engaged in manufacturing and supplying the high quality assortment of tuning forks. tuning forks are available in sizes of 128, 256, 512, 1024, 2048. Glass Agencies EROSE are Manufacturer of Tuning Fork. 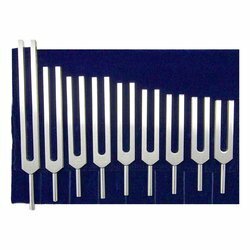 Tuning ForkTuning Fork A-426.6Tuning Fork B-480Tuning Fork C-256Tuning Fork C-512Tuning Fork D-288Tuning Fork E-320For educational purposes only.Not for tuning instruments. A tuning fork is a metal instrument with a handle and two prongs or tines. Tuning forks, made of steel, aluminum, or magnesium-alloy will vibrate at a set frequency to produce a musical tone when struck. The vibrations produced can be used to assess a person's ability to hear various sound frequencies.